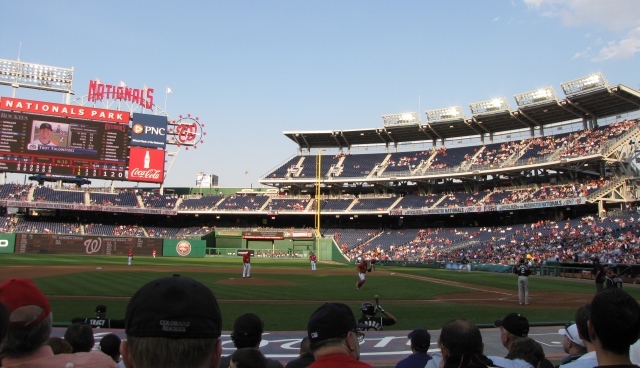 The WSJ takes a closer look at Mr. Strasburg’s efficiency. The Phillies are one step closer to being back at full strength. Weaver’s Tantrum compares the ghost of George Sherrill past to the ghost of Will Ohman present. Why? Trade bait, of course. The LoHud Yankees blog makes an awesome Counting Crows reference. The Common Man ran down all sorts of opinions on the replay debate. Talk about doin’ your homework. From three days ago, Murray Chass whined so much that I discontinued reading about three paragraphs into his latest screed. Read if you dare. This is what $30 gets you in the park of a team that is not yet loved by its city, hosting an unpopular visiting team during a day game on a Thursday following a rainy, dreary Wednesday. To answer my own trivia question from last night: the last time two pitchers faced each other when in their previous games they had each thrown a complete game shutout and one of those shutouts was a no-hitter – 90 years ago. I don’t remember where I saw it, but I did. Look it up. The pitchers didn’t disappoint. Jimenez got the (not curly) W on the strength of 7.1 IP, 5 H, 0 R, 2 BB, 5 K, 121 pitches. Livan went 8, 4 H, 2 R (on two solo HRs), 2 BB, 5 K.
Observations: Ubaldo looks like an athlete. He’s 6’4”, 210 lbs., so a little on the lean side, but definitely an athlete. And boy he can throw hard. He left some Nats looking pretty baffled. Very nice outing. I think he’s now on my list of guys I will go out of my way to watch. Livan makes me laugh. This season he’ll easily pass 2800 career innings pitched and he looks like he could throw another 2000. His arm is just made of rubber. 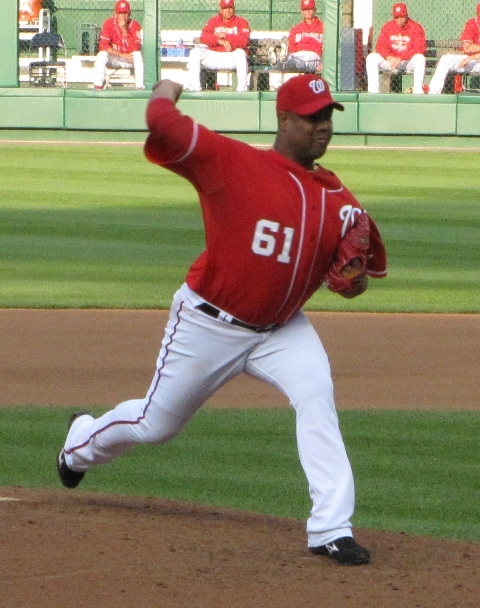 The highlights of the day for me were when Livan dropped in his slow breaking stuff. He’d be cruising along throwing 80s, sometimes hitting mid to high 80s, and suddenly he would toss a 64 mph breaking ball. Every hitter was miles ahead of those and I literally cackled every time. It was comical. If you watch this video you’ll see one slow ball at the 12 second mark, and a much better one at the one minute mark that includes a great reaction by Troy Tulowitzki who can’t believe what just happened. It’s also funny that the molasses-slow breaking stuff that fooled the hitters to badly is still faster than my fastest fastball. Just barely, but still.